YAY! : I just found out I got cast in Assassins as wannabe Nixon assassin, Samuel Byck! I've been a fan of the show for years so I'm very happy at the moment. It should be a great production and I can't wait to get started! YAY! : In movie news, it looks like Grove Lake is going to be screened on the IMAX screen at the Indiana State Museum on March 22nd! I don't know if I'll get a chance to see it, but the thought of a giant version of me terrorizing the state capital is oddly appealing. It's always a treat to hear from small press legend Matt Feazell! 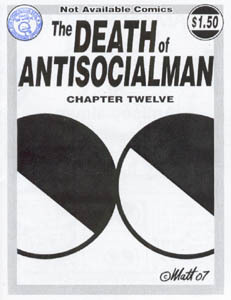 Besides passing on some holiday greetings, Mr. Feazell was kind enough to give me the final chapter of The Death of Antisocialman which was a thrilling conclusion to the Antisocialman saga. Thanks, Matt! In 2007: I was in a comedy that featured me pulling down my pants every night (Don't worry! I was double bagged for safety), I attended S.P.A.C.E with the Dalton boys, I drove to Austin to see my friends and actually got a glimpse of the elusive Harry Knowles, I attended a high school reunion, I got a part in a student film, I threw worms at an old lady, I worked a lot of overtime at Touchy Feely Fotos, read some good books, actually went to the movies, and that's about it. So far in 2008: I accidentally fried some pork chops covered in powdered sugar (I thought it was flour), I was yelled at by a complete stranger, and I reluctantly dropped out of One Flew Over the Cuckoo's Nest. Hopefully, the best is yet to come!